Following a balanced diet is, as we know, the most sensible way to lose weight or stay in shape, but it's easy to get into those bad habits that make us want to eat more. Making 5 small changes to your lifestyle and your approach to food can help you overcome the appetite challenge. Your body produces both hormones and brain chemicals that make you feel hungry or tell you when you've had enough to eat. The hormone leptin regulates your metabolism. Low levels of leptin will make you feel hungry. Grehlin, a hormone found primarily in the stomach, stimulates the appetite. If these appetite regulating hormones are out of balance you will tend to over eat and gain weight. Studies show that sleep deprivation alters hormones and increases appetite. Getting enough sleep and sticking to a regular sleep pattern can help to keep these hormones in balance. Don't rush your meals. Too often these days we don't take the time to sit down and really enjoy our food. In fact, a lot of the time we are in such a hurry to wolf it down that we barely taste it. Take time over your meals. Turn off the television set. Sit down at the table and relax. Take at least twenty minutes and up to an hour over dinner. This will help you stay much more in touch with your appetite. If you are eating more slowly you will realise when you are full and will not tend to over eat. You will also find eating a much more pleasurable experience if you take the time to savour every mouthful. Don't succumb to portion distortion. Over the past ten years we've been eating larger portions in restaurants, and we're eating more at home as well. We are often encouraged to buy larger-sized portions because they provide a better value for our money. But while these oversized portions may be good for our wallets, they are not necessarily good for our waistlines or our health. Exercise portion control. Studies have shown that the more you serve up on your plate the more you are likely to eat, even if you are full, so keep those portion sizes small. Say yes to salad. 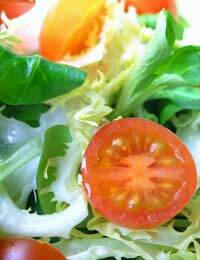 Eating a salad before lunch or dinner is a sure-fire way to stop you over eating and it is a healthy option. If the thought of salad doesn't stimulate your appetite get creative. Stop thinking Iceberg and carrots and think more of spinach, apples, nuts and radish. You can mix and match your fruit and vegetables to suit your taste buds, just remember to stick to the fat free or low fat salad dressings otherwise you're undoing the benefits. After you exercise your body will need to replenish its fuel stores, but if you're not careful, you could negate your entire exercise session in one post-workout meal. There are several things you can do to avoid this. Ease up on the exercise. Studies have shown that people who exercise intensely consumed enough after to replace nearly all the calories they burned during their exercise. When they did lower-intensity walking, they had healthy appetites but still netted a 177-calorie deficit for the day. Drinking plenty of water can help. People who drink between 6-8 glasses of water each day consume almost 200 less calories per day. Research suggests that the best time to eat is within 30 minutes of working out. People who eat later than tend to eat more.